Coverage Area: 25-gram syringes. (Approximately 9.2cc) At a layer 0.003" thick, one tube will cover about 200 square inches. Due to the unique shapes and sizes of the particles in Ceramique 2, it will take a minimum of 25 hours and several thermal cycles to achieve maximum particle to particle thermal conduction and for the heatsink to CPU interface to reach maximum conductivity. (This period will be longer in a system without a fan on the heatsink.) On systems measuring actual internal core temperatures via the CPU's internal diode, the measured temperature will often drop slightly over this "break-in" period. This break-in will occur during the normal use of the computer as long as the computer is turned off from time to time and the interface is allowed to cool to room temperature. Once the break-in is complete, the computer can be left on if desired. This item is covered by Server Superstore Return Policy. Pros: - HUGE tube! I have gone through about half of the tube on using on countless chips. - EXTREMELY viscous, this stuff does not run for the most part even when heated. - NOT ELECTRICALLY CONDUCTIVE. If you're a little bit messy, this stuff will not damage any components in large part from experience. - Thermal performance is only slightly affected, if not affected at all if you have to move around a heatsink, e.g. when you are using metal retainer clips on something that is passively cooled. - Excellent thermal conductivity. Performance is comparable to other electrically conductive pastes, within a few celsius. Other Thoughts: I would highly recommend this paste to anyone that has to frequently service any sort of electronics requiring thermal paste, it serves my needs well in laptops, desktops, and tablets. Pros: Lowered the i5 7600(non k) temperatures from 7 (idle) to 15 (gaming) degrees Celsius when used on delid and cpu cooler interface. *in conjunction with Noctua NH-D15S 140mm SSO2 D-Type Premium CPU Cooler, NF-A15 PWM Fans; upgrade from stock Intel cooler. 20 hour break in period is tops! This large container can do multiple jobs. Super stable temps, with flash like speed cool downs. Core temps are grouped within 5 degrees. Cons: Can't find any. Not the coldest running thermal paste, so be sure to check out the specs and consider your build goals. Other Thoughts: This is my go to thermal paste now. Used to use Arctic Silver 5 for years. Other Thoughts: I'm pleased with this stuff. Cheap compared to other compounds, but has made for 2 very reliable, cool-running PCs. Other Thoughts: -Less messy than any silver based thermal paste I have ever used. -Brought my system's idle temps down to just a few degrees above human body temperature, which is pretty neat. Pros: The best Pros is that I can't think of any Cons. Been using Ceramique for years. Never needed anything else. Great temps. Ease of use. This is the same price as a 2.5g tube. I think I just got my last tube ever. Cons: Every year I get older. Other Thoughts: Without Newegg.com I would only use the internet around 5 mins per month. Pros: Good instructions online. Need to find out exactly what type of CPU you have. I have not checked temperature if thermal compound is effective, after breakin period. Cons: Compound does not easily spread. Would be much better if a tad more liquid. Syringe was packaged in a flimsy bubble envelope. The handle of syringe tore a hole on the envelope. 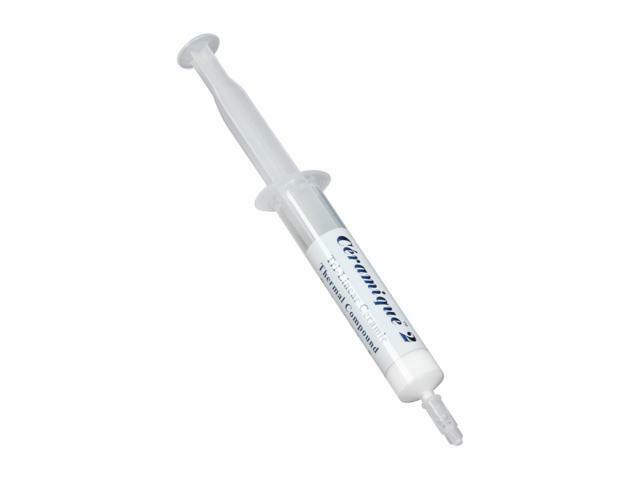 Lucky to have no damage to syringe..
Pros: I have used a ton of compounds and this one is the best! Easy application and spreads evenly very easily. Keeps my AMD FX-8320 in the 20's with my Corsair H100i GTX Liquid Cooler. Cons: Tip of container breaks off easily, first tube was a huge mess. Replacement was great.